The application is open until February 24, 2018. The recent historical detection of gravitational waves (GWs) by the LIGO scientific and Virgo collaborations heralded an unprecedented new era for fundamental physics investigations. After the remarkable landmark of detection, GW science will soon turn into the study of the properties of the sources and address fundamental questions in astrophysics, fundamental gravity and cosmology. In particular, binary coalescences – of comparable masses or extreme-mass ratios – are posed to become the leading probe to test gravitational dynamics, and the physics of compact objects under unique conditions. The number of events detected up to now has demonstrated the feasibility of direct detection of GWs emitted by coalescing compact objects, and that black holes in binary systems are relatively common in nature. We expect many events per year once LIGO is running at designed sensitivity. The correct interpretation of results and their physical consequences will thus become the ultimate goal of the field. Typical searches for GWs thus require very precise signal templates, which in turn demands state-of-the-art numerical and analytical models, to enable also the most accurate parameter estimation. Moreover, extracting the most information from the waveforms requires very efficient search algorithms for data analysis. The new era of GW science will become a truly interdisciplinary subject. The nascent field of Gravitational Wave Astronomy encompasses source modeling, data analysis, fundamental gravity, cosmology and astrophysics, to realize the full potential of this new era. 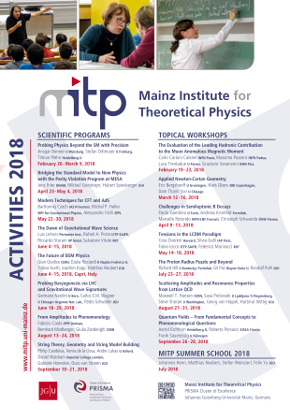 We aim at bringing together researchers focusing in different areas of this emerging field that goes under the umbrella of GW physics, ranging from field-theoretical methods, numerical gravity, astrophysics and signal analysis. Our main motivation is to create an environment that fosters exchange between scientists with different backgrounds.